The SLFP members in Anuradhapura yesterday adopted a resolution nominating President Maithripala Sirisena as the party’s next Presidential candidate. This proposal was submitted by SLFP National Organiser and former Minister Duminda Dissanayake. Former Minister Tissa Karaliyadde seconded it. The convention held at Party office in Anuradhapura marked the inauguration of party’s restructuring programme in the Anuradhapura district. Dissanayake said President Maithripala Sirisena is the only one choice to be the next SLFP Presidential candidate. President Maithripala Sirisena will be the next Presidential candidate, SLFP National Organiser and Parliamentarian Duminda Dissanayake said. He said President Sirisena will remain in office until 2025. We would never allow various hypocritical forces to damage or exploit the SLFP for political mileage. “There are bankrupt politicians who change their political stance, when in power and play a different political role when they have lost power. They then try various gimmicks to gain political power. Now they are spreading false and malicious stories about foreign invasions. America has now brcome the cynosure. There is no need for America to set up a military base in Sri Lanka. We would never allow such a thing to happen,” Dissanayake said. He was speaking after inaugurating the Anuradhapura district SLFP re-organisation campaign. Dissanayake said that the American issue was creating unwarranted fear, doubt and misunderstandings among the people. “Some statements over the issue were humorous,” he added. “I personally believe that at present, there exists a national government. The President who is also the SLFP leader and Head of the Cabinet represents the government. In this background, we are obliged to remember the role of former President Chandrika Bandaranaike Kumaratunga. 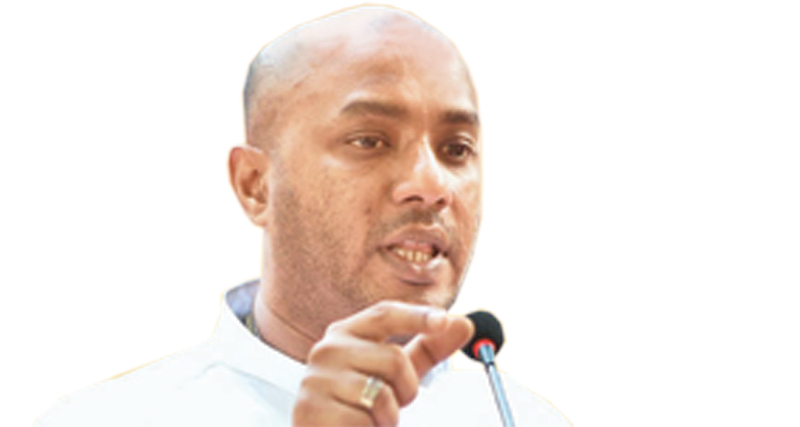 While continuing to be in Opposition, she was able to gain power for the SLFP,” he said. “Chandrika Bandaranaike Kumaratunga provided tremendous support to initiate the political revolution in November 2014. This helped thwart the anti democratic activities of the Mahinda Rajapaksa regime,” Dissanayake further said. The Sri Lanka Freedom Party has approved a proposal to nominate President Maithripala Sirisena as the SLFP’s Presidential candidate at the next Presidential elections. This was proposed by SLFP Parliamentarian Duminda Dissanayake.